The HRO dial introduced by the National Radio Company in late 1934 was the hallmark of top-of-the-line National receivers from the mid 30s through the 60s. By late 1936 the "HRO dial" was appearing on the NC-100 series of receivers and even the 1-10, National's VHF receiver. Throughout WWII many of the NC-100 variants that National provided to the military used this same dial. By 1950 National had added built-in direct frequency readout to the HRO-50 but still kept the same 0-500 reading dial. Through the mid-50s and into the 60s National mimiced the HRO dial look on their mid-priced receivers such as the NC300, 303 and 270. Even the solid state HRO-500 introduced in the early 60s used a version of this dial. 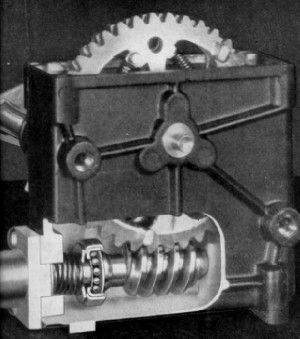 When combined with the required 20 to 1 venier gear drive, the HRO dial provided an effective scale length of 12 feet and was direct reading to 1 part in 500. Ten turns of the dial drives the tuning capacitor stop to stop. Published HRO calibration curves showed each ham band spread over eight turns (or 400 divisions). 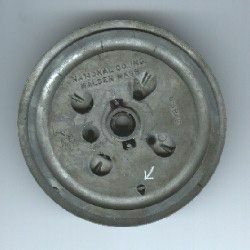 In addition, dial divisions were about 1/4 inch apart. On all bands below 10 meters the HRO dial is easily resettable to within a KC (or KHz). The HRO dial is designed to be used with a gear drive. Used alone, it provides no vernier action. The gearing integrated into the dial only drives the numbers showing in the five windows spaced around the dial. Key to the functioning of the dial is the bushing normally attached to the front of the gear drive. This bushing holds the dial backplate so that the internal dial gearing is properly mashed. Also key is the proper backplate to dial alignment. If the two are not properly aligned, they will bind up and the proper dial numbers will not appear in the windows. Much of the dial remove/adjust instructions below deal with getting these two properly aligned. 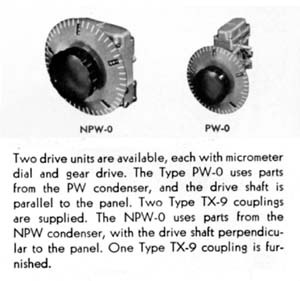 The NPW and PW gear drives were both designed to work with the HRO dial. Both provide 20 to 1 reduction and both have spring loaded gears to compensate for wear leading to backlash. The PW right angle drive was introduced first for the HRO series of receivers. Later it was also used in the National 1-10 and HFS VHF receivers. In order for the NC100 series catacomb receivers to maintain minimum capacitor-coil lead length the straight though NPW drive was developed. Internally these two drives are very different. 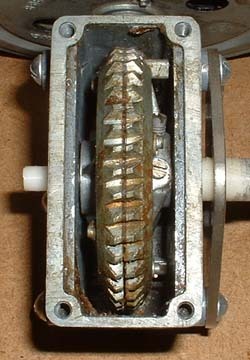 The PW drive uses a worm gear driving a split gear. The split gear is spring loaded so that the teeth will resize to compensate for wear. This design is particularly straight forward using only one worm gear and the split gear. The NPW gear drive is much more complex, looking more like something out of a clock. It uses a total of six gears, one of which is spring loaded. Three different gearing systems combined two different ways met the tuning requirements of several series of National receivers over a 30 years time span.The HRO dial is uniquely National. It set a standard for accuracy and resetibility. Even today the HRO dial remains the mark of a quality radio. If the HRO dial appears to bind as the receiver is tuned then the dial needs to be removed and the backplate properly remashed. It is important to not continue to use a binding HRO dial. Doing so may permanently damage the dial. 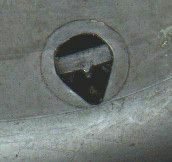 (a) Locate small window near outer periphery of dial backplate and also locate dial number window on face of dial which is 180 degrees removed from the small backplate window. (b) Hold dial so backplate lies flat in palm of left-hand and with right hand rotate dial knob until 250 appears in previously located dial window. (c) If dial is properly adjusted it will be noted that the pointer at the outer edge of the small window lines up with a marked tooth on the dial itself. It will be found that the dial and backplate can be moved so that the backplate pointer will mesh between teeth at points equidistant from marked tooth in'either direction. (d) If by checking as in paragraph (c) the dial is found not properly adjusted, it will be necessary to separate the backplate from the dial far enough to bring the two gears out of mesh and then re-mesh the two parts until the proper setting is found. With the dial and backplate gears meshed remount the dial first setting the capacitor to approxiamately 50%. Check for binding being careful to not go beyond 0 or 500 on the dial. A number of trial settings may be required before the correct mesh is found. (a) With the dial on the capacitor shaft and set-screws tightened, turn the dial counter-clockwise to fully mesh the capacitor rotor plates so that the tips of the rotor plates are flush with the edge of the stator plates. (b) Loosen set-screws and rotate dial slowly until the dial reading has decreased to zero. (d) Check position of rotor plates at zero. The tips of the rotor plates must be flush with the edge of the stator plates. A slight adjustment may be necessary and this is done by loosening the set-screws, adjusting the position of the dial and tightening the set-screws again. If it is necessary to remove the dial at any future time, turn to 250 before removing the dial and do not disturb the setting of either the dial or capacitor until reassembled. If in doubt about the correct position, inspect the springs on the back of the dial. when the dial reads 250 these springs should be straight-up-and-down, they must not be tipped to one side. 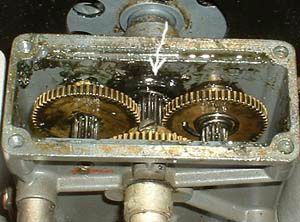 PW gearbox backlash is usually because the split gear is stuck together. Remove the top of the gearbox. Notice the four springs around the edge of the split gear. These should pull the halves of the split gear to compensate for worm gear sizing or wear. Carefully seperate the split gear just enough work some sort of light oil into the split. Rotate the gear and repeat several times. Add a little oil to further loosen things up and to soften the old greese. With everything well lubricated, work the tuning cap several times through it's range. The split gear shouild shift to pick up the backlash. Typically the takeup spring must be tightened. One way to do this is to carefully shift the spring end to the next tooth on the "barrel gear". If done carefully the spring will not pop loose.